Latte: Ben's working on Dragon Slayer Earflap Hat. Ben is going to make Viking Hats. Bitter Cup: Abby messed up the Dahlia sweater and is tinkling an inordinate number of stitches and rows. 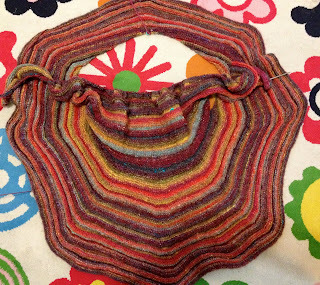 Take a Bite: We talk about shawl shapes. Abby mentions "More than Circular" from Shawls and Scarves. Ben talks about the advantages of seamless sweaters, and we talk about sock ribbing. We recommend the Topdown Raglan Generator and The Knitter's Handy Book of Sweater Patterns We mention EZ's percentage system (EPS) as well. We talk about the Old Norwegian cast on. We have posted a video that demonstrates how to do this versatile and stretch cast on. Caffeinated: Ben's excited about the new album from White Denim. Abby's excited about cooking from scratch. Most recently, she made a fantastic soup from the book The Daily Soup Cookbook. Latte: Ben is working on the dragon hat. Abby cast on the Dahlia sweater in Chickadee from Quince and Co. Bitter Cup: Abby frogged her Cat Mittens when she was running low on yarn. Ben had some trouble with symmetrical charts. Abby discovered the reason for her yardage woes on Strata Sphere. Brewing: We talk about style. References include What Not To Wear, Kendall Farr's The Pocket Stylist and Style Evolution, Advanced Style, and Jean Frost's Jackets and Custom Fit Knit Jackets. Chai: Ben went to see Wild Flag at Neumos in Seattle. Stir: Abby starts to spin with her new Sidekick, but had some trouble with long-draw technique. The Tip Jar: Ben suggests that you get redundant with your patterns, Abby advises you to organize your needles, and asks for app recommendations to do so. Announcements: We reveal the winners of Ben's Challenge: Stripepike's Hot Pink Orchid Thief and ExecutiveKnitter's Leopard Slippers. Latte: Ben is still knitting the magenta earflap hat. Abby is still working on the Cat Mittens. 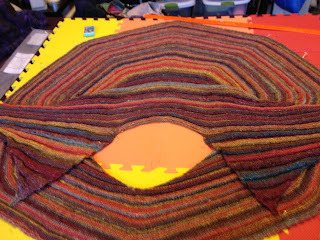 She talks about twined knitting on the Klieo shawl. Bitter Cup: Ben accidentally donated yarn he needed. Abby bought less and more yarn than she needed for Strata Sphere, and made some mistakes on the Cat Mittens. Brewing: Ben wants to knit a Guy Fawkes Mask with a three-dimensional mustache, inspired by the Move Your Money march. Abby contemplates stitch definition and even knitting. Taste: Abby reviews The Knitter's Life List by Gwen Steege. Caffeinated: Abby is excited about Project Accessory. Ben recommends The Smiths' remastered collection Complete. The Tip Jar: Ben suggests organizing your yarn and subdividing your stash. Abby reminds you to buy extra yarn in proportion to your project. Announcements: Occupy Wall Street has put out a call for urgent winter donations including wool scarves and hats. See ravelry group. Latte: Ben is working on a Seussian earflap hat using the chart from Beware of Dragons. He hasn't yet finished the Classic World War II Watch Cap. Abby is making progress on her her Strata Sphere. She's still working on the Cat Mittens, and the Klieo shawl. Grande: Abby finished Cassidy. Again. Chai: Ben and some friends threw together Doctor Who costumes for Halloween with mixed results, using several finished knits. Abby visits The Knitmore Girls in California. She visited Sweet Pea's Crepes, bought a Schacht Sidekick at Purlescence, and met the Jade of the Geek Girls Crafts podcast, Miss Kalendar of Brass Needles, and Laura, The Joy Of Cooking Fairy. She visited Bobbin's Nest, You can find the Knitmores' account of the trip in Episode 166. Demi Tasse: Ben opens his yarn from Rhinebeck, Transitions from Gypsy Girl Creations. 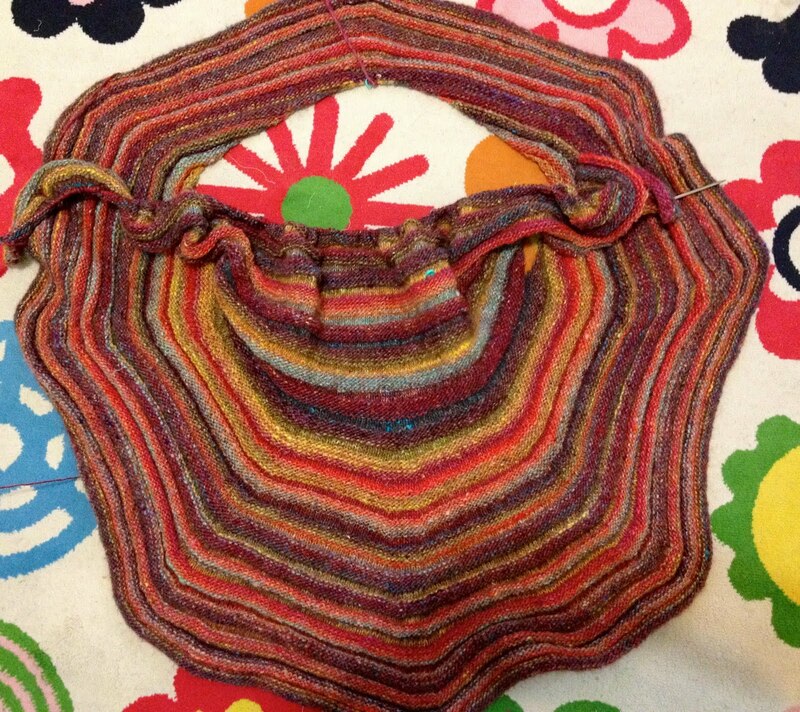 Taste: Abby reviews Clara Parkes' The Knitter's Book of Socks. Stir: Abby learns long draw spinning.